Ocean acidi what? | Watts Up With That? I have followed Wattsupwiththat for a long time, only posting occasionally if I feel an article or presentation is biased, or if there seems to be some sort of data misrepresentation. I choose to follow watts simply because there is less bias and far more numerical analysis of papers than most other climate news sources. I would certainly consider myself a climate sceptic, but my scepticism is part of everyday analysis for me, I simply don’t believe someone unless they show me the evidence. It is evidence that is lacking for me on the warmist side of the argument; we simply don’t have a temperature record which is accurate, or long enough to infer some sort of anthropogenic effect. Proxies offer a decent long term view but are poor analogs for climatological variations in the past 200 years or so. Anyone who has worked with computer models should know, they are more likely to display what you want them to display and should always be taken with a grain of salt. Luckily I don’t have to make those arguments; there are plenty of other commentators with better credentials to make those arguments for me. I am but a lowly chemical engineering graduate, who has found neither a job nor academic position in this economy. Within the past few weeks, a post went up which seemed more interested in ridiculing the author than refuting the claims. I was shocked, and I waited, at first it was a few days, then I let a week pass. All of those people who were more credentialed than I were silent. Certainly there was a comment on Henry’s law but nothing going into the necessary depth for refutation of the claims for doom surrounding ocean acidification. Unfortunately it’s a refutation that we need. Ocean acidification is the carbon controllers pinch hitter, the ace up their sleeve, or other analogous win card. It’s easy to refute global warming and associated doom based on the contradictory evidence. In the case of ocean acidification its associated doom mechanism is much more difficult. To tackle ocean acidification you need to understand chemistry; pH, alkalinity, buffers, strong vs. weak acids. But you also need to grasp the math; Henry’s law, pH. and equilibrium constants. That’s why most of the time ocean acidification comes up as the last line of defense for carbon controllers, you might not understand it, but neither do they. This is an excellent reference point for us; it clearly and concisely lays out the argument. However it waves a hand over the how in favor of visual demonstrations. I will deal with these later but for now let’s talk about the processes underlying ocean acidification. I have performed several laboratory experiments regarding CO2 and water. The first was to take a sample of river water and start mixing in atmospheric CO2. Using this method we were eventually able to overcome the buffer capacity of water and reached a pH of about 6.3. In another experiment we had a CO2 stripping column with water coming down the column and air with a variable CO2 feed going up. This experiment had already been run multiple times throughout the semester without a water changeover. Because of this my lab partner and I saw higher CO2 concentrations in our outlet stream than our inlet as the CO2 would off gas at anything below 19% concentration which was just slightly below the maximum feed we could add to our column. To understand acidification you have to understand a little bit about mass transfer. Within a homogenous fluid, that is at equilibrium diffusion essentially forces and maintains an evenly distributed concentration. Whenever there is an interface such as an air to liquid separation then diffusion will occur across the boundary dependent on partial pressures. A partial pressure in the atmosphere can be determined by the system pressure * the percentage of atmospheric composition. Of course this tells us nothing about pH, but chemistry does. pH was first conceived in 1909 by S. P. L. Sørensen. It was revised in 1924 to be used with electrochemical cells. pH represents the negative log of the hydrogen Ion concentration in solution. So at pH 7 your water has roughly 1*10^-7 moles of hydrogen ions per liter. at pH of 8 there are 1*10^-8 moles/liter of hydrogen ions. commonly the scale extends from 0-14, however pH can go into the negative range and exceed the boundary range of 14. We measure pH through electrochemical cells using the nernst equation. Seen as equation 3, R is the gas constant, T is temperature and F is the faraday constant. pH meters aren’t simple devices. Essentially the Nernst equation measures electric potential, and plots it with respect to pH. To calibrate these instruments ideally we measure the voltage at a known pH and then at a secondary pH correcting for the slope. There are however so many things that can go wrong in a pH measurement that it is more suited to simply getting an idea of the pH rather than take a reading as gospel. First a pH meter must be stored so as to maintain a liquid layer over the glass bulb, or else it doesn’t read pH properly. Secondly the Ionic fluid in the meter must be maintained or replaced periodically; otherwise the pH meter is likely to have a poor slope. Calibration solutions should closely match the pH of what you’re trying to measure as the linear slope is only a reasonable approximation within a few pH units. If you aren’t simultaneously measuring temperature and pH in both your buffers and the desired fluid temperature corrections can be off. In short it’s far easier to measure a 1pH unit change than a .1 and .01 and smaller increments are virtually impossible to reliably measure. So how do we go about acidifying oceans from CO2? for that we have to consider chemical equilibrium. All CO2 dissolved in water will essentially form carbonic acid, given enough time, most of it will change back into CO2. the rate at which CO2 is converting to carbonic acid and carbonic acid back to CO2 eventually balances out so that If we know our CO2 concentration, we can know our carbonic acid concentration as well. The amount of carbonic acid in freshwater is roughly 1.7*10^-3 in pure water and 1.2*10^-3 in seawater. There is substantially less carbonic acid in seawater. So why are we concerned about ocean acidification when rivers and streams can hold more CO2? They also get direct carbonic acid from their rainfall sources. Equation 4 shows the conversion. Carbonic acid does not however make the water more acidic easily. Don’t forget that pH measures the concentration of hydrogen ions in solution. So of the 1.2*10^-3 moles of carbonic acid/ mole of CO2/liter only 2.5*10^-4 moles/mole/mole of hydrogen Ion are produced. This forms the bicarbonate Ion. Because weak acids and weak bases vary back in forth during equilibrium they make excellent buffers. A buffer is a solution made up of one or more weak acids and bases that can be created to hold a desired pH. Essentially because the weak acids dissociate more frequently with a base present in solution and weak bases with an acid, you can hold the pH of a solution relatively stable. Your buffers pH will only change when you have consumed your entire weak acid or weak base. The bicarbonate Ion can further dissociate but only 4.69*10^-11 of those ions do so. Now the Rub for the ocean acidification = ecosystem collapse comes from a third reaction in equation 6. For some it may not be baffling but let me explain the humor. Calcium carbonate is supposed to react with the Hydrogen atoms to form a free calcium Ion and 2 bicarbonate ions. But wait, the equilibrium concentrations are still going to hold. So as CO2 increases, carbonate Ions the ions “under attack” by ocean acidification WILL ALWAYS INCREASE IN CONCENTRATION!!!!. But how does that relate to biological organisms. In short anything that needs to make use of carbonate will benefit from an increase in its supply. But there is actual math here too. Behold the Monod equation for microorganism kinetics. U is the specific growth rate, umax is the maximum growth rate, s is the concentration of the limiting substrate and ks is the value of u where u/umax is .5. Essentially what this states is the growth of an organism is tied to the limiting nutrient. So we can conclude that as CO2 increases, Carbonate ions increase, which means that the limiting nutrient for shell production cannot be carbonate. If it was, then an increase in CO2 would correlate to a similar increase in growth for the carbonate dependent species. In the event that carbonate was in such comparative excess there is no conceivable means for the species to be struggling as all of the aqueous carbonate would be consumed at a substantially higher rate than CaCO3 precipitate. All of this is ignoring the buffer capacity of the oceans; it is immense and tied strongly to the carbonate system. While you can increase the amount of carbonic acid in the sea, in order for CO2 to induce a pH change you would need a massive amount of it both dissolved in the ocean and with a high concentration above in the atmosphere. It is essentially chemically impossible for ocean acidification from CO2 to induce harm on carbonate dependent species. Before we can ever truly figure out whether or not CO2 is causing a problem we need to know the rate the shells are dissolving compared to the rate they are being formed. Great, now we understand some of the physical, chemical and biological processes underlying the ocean acidification=doom argument. In order to determine the actual effect of increasing CO2 concentration in the atmosphere we have to look at the concentration of CO2 and temperature at 2 points in time as both are changing. For my example I decided to use the EPA’s stated 1.5C temperature increase since 1917 and an increase from 280ppm for my concentration. I used 10C as my current water temperature and 390ppm as my current CO2 concentration. Atmospheric pressure was assumed at 1atm. I also kept hearing a pre-industrial pH value of 8.2. This calculation is done under the assumption that preindustrial pH system was stable and thus increases from emissions will essentially add to the previously existing H+ concentration in the solution. Which means our concentrations for preindustrial and modern CO2 are given by equation 8. That’s not even measurable. In order to see the claimed pH increase the atmospheric increase in CO2 would have to be 100x greater than what has occurred. Surely we can say the acidity, a measure of h+ ions has increased 30% but that’s guaranteed from the chemistry and tells us nothing about the oceanic quality of life. See to do that we would need to perform an experiment and actually collect data. Unlike global climate change these studies are comparably simple. Get a bucket and a CO2 tank add some corals and oysters and other carbonate loving critters and then set the atmospheric CO2 concentration above the water, find out what happens. Repeat the study for pre-industrial, modern double modern and prehistoric levels of CO2 simply add food and allow Ion exchange. In less than 5-10 years someone could conclusively prove CO2 is causing harm. Even if you didn’t want to actually collect data there is one other scientific principle that the carbon controllers are violating. That’s the correspondence principal; we can look back at history and watch how CO2 trends match with carbonate critter fossil records. If we actually look back far enough to when CO2 was at its peak levels on this planet we find that most of our mollusks and carbonate dependent organisms evolved at the same time our atmospheric CO2 concentration was over 8,000ppm. Before anyone gets to claim that carbonate organisms are having problems they need to answer why they can’t deal with a CO2 increase of 30% while their ancestors thrived at concentrations higher than 200%. It just doesn’t make sense. She starts with 2 clear and noncontroversial statements and then 1 that is somewhat controversial, at least for me. Specifically that increased acidity makes it difficult for Calcium carbonate Ca(Co3-) dependent organisms to survive. For her first demonstration she drops a block of dry ice into water and and we get to see some bromothymol blue change colors from blue to yellow. So yes she demonstrated that CO2 does make water more acidic. But she also clearly mentioned Atmospheric CO2 having an impact on ocean acidity. By dropping pure CO2 into the water it is essentially creating a system with 100% partial pressure at the liquid vapor interface. Essentially they are increasing the atmospheric CO2 by a factor of 3000. The second demonstration was more of the same shenanigans. First they divvied up acetic acid vinegar, not carbonic into three concentrations; 1 with none, one with half and one with a concentration straight from the bottle. She then added some calcium carbonate, OOO fizzies. so yes the acid does react with the shell and outgasses CO2. No kidding, that has what to do with a carbonic acid/carbonate system? and that glazes over the fact that a CO2/carbonic acid system has a pKa value of about 6.3, acetic acid is closer to 4.8 it has both a substantially higher dissociation constant and does not form a carbonate complex. Essentially the demonstration showed nothing. ose the most meaningless way of demonstrating nothing, they didn’t use a chemically similar environment and they didn’t use actual organisms who regenerate their shell and that is fascinating. So if you have made it this far and your head hasn’t exploded congratulations Here are some bullet points. 1. It is Interesting to note that we somehow have an accurate measurement of ocean acidity from 200 years ago when the apparatus to measure pH was only invented in 1924 and it wasn’t conceived as a measurement until 1909. It should be impossible to conclude within .1 pH unit the actual oceanic pH 200 years ago. 4. Rivers and freshwater lakes are more susceptible to carbonic acid from atmospheric CO2, so why are we worried about the oceans? 6. Carbonic acid is not the same as hydrochloric or acetic acid. 8. There have been no experiments to demonstrate harm, only hypothesis and models. 10. The organisms most susceptible to ocean acidification from CO2 evolved at a time when concentrations were 15 times higher than today. 11. Ocean acidification means nothing if the rate at which CaCO3 is being produced exceeds the rate at which carbonic acid consumes it. 12. The buffer capacity of the ocean is huge and incorporates carbonic acid, further demonstration of CO2 overwhelming this buffer is needed. In addition, even if it were possible to demonstrate some deleterious change due to changing pH, most of the shelled organisms have a reproductive strategy that involves thousands or even millions of larvae, of which a few percent at most will survive to adulthood. And whatever the preferred pH of today’s adults, the few larvae that survive will tend to be the ones better suited to the new pH. So even if the individual organisms cannot adapt quickly, the overall population can. I recommend the 100# bag, in the case of climatologists’. And clamatologists’, as well. What would happen if, as some carbon sequestration proponents propose, the oceans were strewn with iron to increase the bloom of micro organisms, which upon death sequester the carbon as calcium carbonate on the ocean floors? No they didn’t lol. Their ancestors did. The species alive today have not contended with 500+ ppm CO2 in a LONG time. And they experienced massive die-offs at all classification levels during rapidly-shifting atmospheric gas levels. Geologically rapid that is, which is usually slow compared to the speed we are releasing CO2. I guess it’s just refreshing to see someone who isn’t trying to blame rising CO2 on nature. It is pleasing to see someone use their broad and applicable knowledge in such a clear, meaningful way. Good luck with the job hunt. Whew, my head didn’t explode. Excellent article and good luck job hunting. I almost stopped reading after this misleading statement. Sorry, but oceans are not acidifying. However, I dallied, continued and read the whole article. Congratulations for this great info. Nicely done – Also its probably worth bearing in mind the quantum of mineral calcium carbonate present in rocks and sediments in the sea or on the coast that would fall “victim” to acidification long before the calcium carbonate being laid down by living organisms. I really think that this is a case of a little knowledge is a dangerous thing. Thanks, Steve. Very good article. Less alkaline is a better description for this. A couple of references I’ve checked, such as this http://www.fao.org/docrep/003/y1899e/y1899e09.htm suggest that your equation 6 is driven to the right, not left, as CO2 increases. Excellent post. You have very well clarified this interesting and technical aspect of the climate debate. Kudos. Bravo. Thank you Steve. As for the job hunt, a lot 0f scientific and industry heavy hitters read this blog. After this tour de force I’ll bet you have valid job offers tomorrow and take a job in a week or less. Come back and post at least a comment on how it goes. I, if I could, would try my best to hire you tomorrow. Again Bravo!! Maybe our education system is producing at least a few creative thinkers. Thank you Anthony for finding and posting this article. The work you do for science will someday be recognized. True, true, the oceans are infinitely buffered. Don’t know where you live Steve, or what your interests/speciality is, but there are lots of chemical engineering jobs available in Alberta. Head almost exploded but I held on – Great article thanks Steve! No mention of carbonate compensation depth? You helped us who don’t really speak physics and math get the big picture. Thanks, I read the whole thing. I’m sure nature will sort it out, as we are nature too.. In a newly published report by Jantzen et al. (2013) on the occurrence of cold water corals and some strange natural pH-gradients in the Comau fjord of Chile, the fact about groundwater springs in the fjord are not taken very seriously: “CO2 and H2 S may degas and further promote the formation of CO2 -rich and low-pH water ‘bodies’, which ascend to lower depths. Further hints for such a scenario are given by observations of white mats of chemotrophic sulphur bacteria of the Thiooloca- and Beggiatoa-group and ‘foul eggs smell’ at sites where low density water seeps out of cracks (Gallardo et al., 2005). These bacteria are usually associated with low oxygen environments.” But even so, the authors find excuses for not taking account of the positive effects of the seeps on the corals: “Nevertheless, the relatively high oxygen situation in deeper water may be indicative of little or no hydrogen sulphide release, low oxygen consumption and sufficient water exchange with oceanic water masses.” And further: “Variations of pH may therefore be determined by CO2 -rich water production, rather than by a daily cycle (i.e. by photosynthetic production, respiration or tide). Nevertheless, daily fluctuations in pH can reach ~0.2 units within day-and-night cycle.” It seems the possibility of nutrients (minearals) from the seeps feeding into the fjord ecosystem is ignored by Jantzen et al. (2013). But even so, the fact remains that the deep-water corals live in water previously thought to be poisonous to them: “This suggests a high adaptation potential of D. dianthus to adjust its calcification performance to conditions thermodynamically unfavourable for the precipitation of aragonite.” (Jantzen et al., 2013). Jantzen C., Häussermann V., Försterra G., Laudien J., Ardelan M., Maier S. & Richter C., in press. Occurrence of a cold-water coral along natural pH gradients (Patagonia, Chile). Marine Biology. (subscription required). See more about the Comau fjord here: (www.oceanacidification.wordpress.com/2013/05/22/occurrence-of-a-cold-water-coral-along-natural-ph-gradients-patagonia-chile/). (Although this is a very interesting summary of their research, Dr Claudio Richer manages to ‘hide’ a very obvious and important fact about the Comau fjord: The fjord contains cool (volcanic) springs along the shores and undoubtedly along its underwater axis. There is little doubt that these hydrothermal springs (seeps) have the same effect on the seawater pH-value as the seeps in the Red Sea, i.e., a bulk lowering of the pH-value. The fish farmers in the fjord from where the ROV was borrowed by the AWI-researchers, know this and also the tourist operators in Chile (see for example: http://www.exchile.com/downloads/Coast_of_fjords_SeaKayak.pdf). Um, any consideration for the mega tons of manganese nodules on the ocean floor? That’s a huge load of metals that will resist any “acidification” (not to mention all the carbonates and other deposits…) I think the buffer capacity is grossly under rated. My first week, I was busy adjusting the chlorine and getting the total alkalinity right along with a couple of other minor things. The pH was reading ‘quite low’ at 6.2, but we didn’t have any “pH Up” chemicals. Finally, the day came to address the pH (as I’d got the rest where I wanted it). Finally I remembered that the ‘low reading’ on a test strip had no real “lower bound”, it just meant “this far OR MORE”… So I hit the pool store for an alkalinizing chemical. I put in about 8 pounds of Sodium Hydrogen Carbonate, and moved the pH to an indicated 7.3 or so on the dipper. Clearly all that added carbon dioxide was unable to make the water acid… (In fact, it leaves the acid water, letting the sodium stay behind, to make it alkaline. So if an acidified river runs into the ocean, carrying it’s load of dissolved salts and CO2, the CO2 will leave the ocean to make it more alkaline. That is the Lesson Of The Pool for pH. So it is not just a pedantic point to say that added CO2 is making the ocean less alkaline. Once the ocean actually does try to become acid, the CO2 will out gas heavily and prevent it. It also is not pedantic to point out the ocean bottom is strewn with megatons of metal in the form of nodules. They, too, will prevent acidification. We have excess of metal and metal ions in the ocean, and the CO2 can leave if it isn’t alkaline. I was enjoying the read until Equation 1. Some definitions, please! I assume that t is temperature. (and at that point I stopped reading). Because weak acids and weak bases vary back in forth during equilibrium they make excellent buffers. A buffer is a solution made up of one or more weak acids and bases that can be created to hold a desired pH. Essentially because the weak acids dissociate more frequently with a base present in solution and weak bases with an acid, you can hold the pH of a solution relatively stable. Your buffers pH will only change when you have consumed your entire weak acid or weak base. All the kooky claims that Man-Made CO2 is destroying (fill in the blank) seem time and again to depend upon misstatement or misapplication of physical law combined with poor measurements or claims of better measurements than possible with little or no uncertainty analysis coupled with a complete disdain for empirical evidence. Nice article, Steve. I propagate sps corals … acropora sp., etc. Recently I had a marine biologist (nice bloke) from the university department of a particular rabid warmista come and have a look at my systems. In passing, he admitted to me that, despite their level of technical capability, they were unable to successfully grow acropora’ let alone sustain it in a comatose state. This tells me that they would not be able to sustain an organism in sufficiently good health to be able to conclude any specific outcomes for ocean acidification studies utilizing live organisms. You are missing an important part of the environment – ROCKS. (or more properly the lithosphere.) Minerals dissolve and form part of the buffer system. This is the part the scare merchants leave out. ….Furthermore, this carbonate buffer is not the only buffer active in the atmosphere / hydrosphere / lithosphere system. The Earth has a set of other buffering mineral reactions. The geochemical equilibrium system anorthite CaAl2Si2O8 – kaolinite Al2Si2O5(OH)4 has by the pH of ocean water a buffer capacity which is thousand times larger than a 0.001 M carbonate solution (Stumm & Morgan, 1970). In addition we have clay mineral buffers, and a calcium silicate + CO2 ø calcium carbonate + SiO2 buffer (MacIntyre, 1970; Krauskopf, 1979). These buffers all act as a “security net” under the most important buffer: CO2 (g) ø HCO3- (aq) ø CaCO3 (s). All together these buffers give in principle an infinite buffer capacity (Stumm & Morgan, 1970)…. I have actually ran a Reef Aquarium (300L) with CO2 injection just to see what would happen. My corals did just fine. The coralline algae was glorious and the green algaes thrived. All in all, it was a stable and very happy Aquarium. I just got back from Santa Rosa where I clear out my storage. It has been broken into several times; lost a lot of stuff. I was not able to find the most important of my notebooks, and it was 20 years ago that I did this experiment so I don’t remember the details that well, but I had to really crank up the bubble rate to have any measurable impact on dissolved CO2. My impression is that far more CO2 goes into the atmosphere from the ocean, then the other way around. Far more CO2 is produced by eukaryote metabolism then from all other sources combined. BTW, my fresh water experiments were far more interesting. I was investigating the role of fungus. Never underestimate the power of fungus! One additional point. The pH of the ocean is not constant as it is. From the equations above, it couldn’t be! Even if it is in equilibrium with a well-mixed gas on top, sea surface temperatures vary wildly from summer to winter, from tropics to the poles, from the surface to the depths. Indeed, the pH isn’t “8.2”, it is anywhere in a general range from 8.2 to 8.5.
is that while there is a surface layer of the ocean that is saturated with calcium carbonate so that it does not tend to dissolve, if one goes down far enough one reaches a level where the water is undersaturated and shell material will tend to dissolve. Decreasing ocean pH — which they do predict will occur on a remarkably aggressive time scale — supposedly decreases the depth of the saturated layer, presumably squeezing the ecosystems of shell-building marine organisms. They also claim that pH has already dropped by 0.1 from the beginning of the industrial revolution, and will drop by another 0.2-0.3 by 2100 if CO_2 doubles etc. Now, I’m not defending their assertions, but playing the devil’s advocate here you are asking me to believe several things. One is that the authors of all of the papers listed on ocean acidification are ignorant of the basic chemistry of the ocean, or that they are making an assumption that is radically different from the assumptions you make above. Another is that there is no interesting dependence on the KIND of calcium carbonate in marine shells — you seem to be lumping aragonite and calcite into a single barrel where marine organisms tend to form shell materials out of one or the other if I understand things correctly. Aragonite seems to be tied into reef ecology and in fact is the buffering material that keeps pH comparatively stable. It doesn’t seem to me that you have provided a sufficient argument to demonstrate either that the pH of the oceans will not change by 0.1 to 0.3 with increased CO_2, when there is already a variation in pH of almost this amount naturally due to many factors including variations in local chemical equilibrium in warmer and cooler waters throughout the ocean body itself, or that you have adequately addressed the impossibility of the upward movement of the boundary layer between definitely undersaturated deeper/colder water and saturated upper/warmer water. Surely if this boundary does move up across a deeper zone inhabited by species specific to that zone (a coral reef, an underwater shelf) it might cause problems for the species living there. You really should read and address specific issues with the assertions in the actual literature — not being familiar enough with the latter myself I cannot tell if you have erected an enormous straw man, or straw reef, by asserting correct things that they would even agree with that have nothing to do with whether or not there could indeed be a problem. With that said, I agree that there are certain parts of the argument on even this FAQ that I find un-credible. For example, one of its references is entitled “The Future Oceans: Warming Up, Rising High, Turning Sour”. The current evidence is that yes, they have warmed by as much as a degree or two post LIA, and they are not unlikely to warm up another degree by 2100. They have risen up by 9 whole inches since 1870, and they might rise up another whole 9 inches — or what the heck, let’s say a whole foot — by 2100. These things are therefore technically true, although no one complained about either one until they were told that this was the harbinger of a future “catastrophe”. However, there is no way in hell dropping oceanic pH from 8.1 (say) to 7.9 is turning the ocean “sour”. Nor is this going to affect any sort of shallow-water mollusks — the saturated/unsaturated boundary is far from the surface in almost all of the world’s oceans, with the exception being the cold polar regions because they are, well, cold. Here they shoot themselves in the foot, as warming confounds movement of the boundary. If the polar oceans are warmer, then they will naturally increase the thickness of the saturated layer and one has to do a complicated analysis to see what the net effect is on the unsaturated/saturated boundary. Their “worst case” expectations appear to be a very solidly basic ocean, not sour at all, considerably more basic than fresh water. One further complaint I might have with this FAQ is that it rather obviously suffers from the usual short/long timescale mixing that climate science uses to build meaningless hockey sticks. 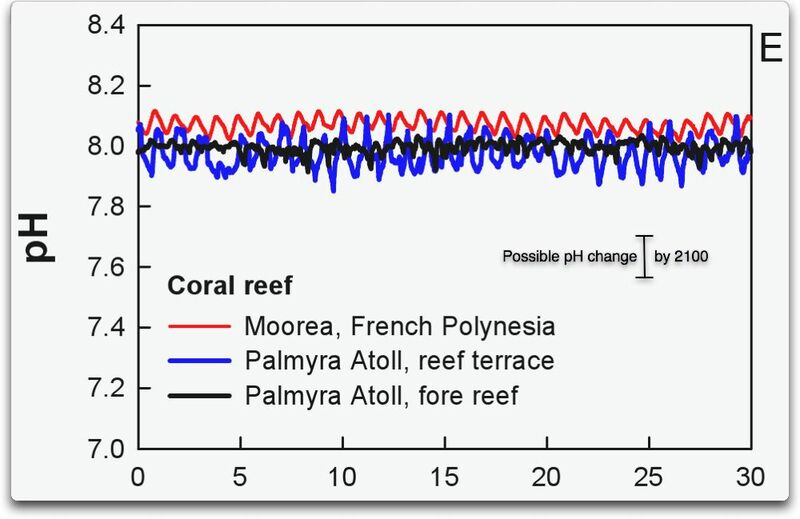 In its very first graph, it displays Oceanic pH over the last 25 million years. As usual, there are no error bars or explanations as to how they might know, but they show a smooth variation from roughly 8 to a peak of almost 8.4, a series of sawtooths generally down with the entire Pliestocene being more or less the final jig downwards. But then at the very end they show 1800 as a sudden jig up! 2000 as an equally dramatic jig down! An unexplained dot that is the terminus of the smooth curve! Two more terrifying dots way down at 2050 and 2100! But they were dead on the dot at 1800. All they’ve showed is that their million year timescale graph is crap, because it smooths/averages over VERY long periods — tens of thousands of years or more. We have no idea if the pH bounced up and down by 0.1 or even 0.3 on timescales of decades or centuries all throughout this time. In fact, one can hardly imagine that oceanic pH didn’t bounce right along with the various major glaciations in the late Pliestocene, e.g. the Wisconsin glaciation. Whether or not their projections for 2050 and 2100 are right or wrong, their graph does nothing whatsoever to indicate whether or not such variation is unusual, unknown, or even occurring at an unusual “rate” (since the text clearly states that the values themselves are not alarming, it is how rapidly the change is occurring that has them worried, supposedly too fast for the species to evolve to accommodate the change?). But we do not really know the average pH of the oceans during e.g. the LIA, let alone the specific pH of individual coral reef environments or the arctic. That is one thing in your article I completely agree with. They make a statement — that oceanic pH has dropped by 0.1 from 1800 — that I would be very, very interested in seeing justified, with the missing error bars. I would wager that the error bars are larger than 0.1, meaning that we have no idea what the oceanic pH has done since 1800. Perhaps we know from 1950 to the present. Perhaps. Which leaves me where I began. I don’t know if there is something to the threat or not. I doubt that anybody does, really. We’ll probably only find out when oceanic species start to drop dead in droves from a “rapidly changing” pH — or don’t. And we will find out, because barring the invention of cold fusion or the wholesale investment of the resources of the United States in e.g. LFTR and a couple of breakthrough discoveries in solar technology and batteries, the industrializing third world countries are going to burn carbon whether we like it or not until their life style is just as good as ours is, as long as it is the cheapest energy out there and really the only game in town economically feasible to play. This will either carry the world oceans solidly over towards the 2050 values or not. Indeed, given that almost a decade has elapsed since many of the papers even in this FAQ were published, given the “dramatic” change they predict/claim, we should be roughly 1/12 of the way there. By 2020 there should be little doubt whether they are right or wrong. In the meantime, nobody is going to change their carbon-consuming behavior at the expense of civilization, either holding onto what they have or reaching for what they have not. Nicely done, Steve. I wasn’t sure where this article was going and somewhere about the first minute of the NASA video I was sputtering and throwing things. Somewhere in my misspent youth I picked up 3 degrees in chemistry, postdoctoral research and a couple of decades in the chemical industry. Most of that time If I had been at a presentation like the NASA video, the presenter would have been laughed out of the place. Actually one that bad and the presenter would have been hooted off the stage. The NASA video was intellectually dishonest to a point that I found truly offensive. Some of the terminology was technically correct, but, as Steve very aptly pointed out, her demonstration was intentionally misleading and pure hokum. Ocean acidification is a scary term if you believe we are turning the oceans into something that would cause sea shells to fizz. And she lead you to believe that with her little demonstration. Absolutely disgusting. The warmists can’t win in the arena of ideas, so they resort to stuff like this. And this is supported by our tax money. One of my lesser talents is patching drywall. I’ll get to hone those skills because of flying objects from the video. Since CO2 comes out of solution at warmer temperatures, shouldn’t the oceans get more alkaline as a result of warmer temperatures? Proponents of CAGW says that increased atmospheric CO2 will made the oceans acidic (less alkaline) but as you point out, this makes little sense. Shouldn’t they get less alkaline in cooler temps, as CO2 is forced back into solution? Or am I totally confused? Steve, thank you for an excellent post. It has been bookmarked as one of my references. I would never claim to know the pH of a small Aquarium with accuracy of less the +/- 0.5 pH let alone an ocean, even with my trusty Hatch, and I am a trained and very experienced professional in making such measurements. Test and Measurement is my livelihood. This equates to the deposition of 4 million cubic metres per square km/100,000 years multiplied by 200 million km^2, roughly the area of ocean less than 4500m deep (carbonate compensation depth, CO2 dissolves below this level) = 800 x 10^12 cubic metres/100,000 years. Now multiply by the average density of limestone -say 2.4 tonnes/cubic metre gives 1920 of calcium carbonate. of which 44% was derived from CO2 =845 x10^12 tonnes. So changing this from 100,000 years to one year gives an annual precipitation of 8.45 gigatonnes of CO2 removed from the oceans each year. In addition the increase in photosynthesis and plant growth as a result of increased CO2 would remove a few more gigatonnes of CO2 but I do not have the data to calculate that. After all that happens is their any increase in oceanic CO2/HCO3/CO3 at all ? Regardless of small scale laboratory experiments, though not doubting their usefulness in exploring specific details of processes, my training and experience as a field geologist leads me to the belief that field evidence trumps the lab. So to the ocean acidification story and its effect on calcareous life. Fringing the Kimberley in northern Western Australia is a fossil carbonate reef system that was almost as big as the present Great Barrier Reef along the Queensland coast. It formed during the Devonian, from around 419Ma to 358Ma [don’t give up yet dear reader]. Atmospheric CO2 levels at the start of the Devonian were 10 to 12 times higher than current levels [around 4000 to 5000ppm] but the sea was not a carbonic soup. Critters survived and prospered. On the evidence of fossil remains I would suggest that concerns regarding ocean acidification are overstated to say the least. Interestingly by the end of the Devonian CO2 levels plunged to around present day levels, accompanied by glaciation and mass extinction. “They are becoming less alkaline.” would be far more accurate. When you’re standing near the South pole and go away from it, you may insist that you’re becoming less southward but you are still going North. It’s just a wordplay with no practical meaning because your motion doesn’t depend on how you call it. I’m happy the article did not fall for this wordplay and provided concise analysis instead. 1. You have to use the complex buffer that we call sea water. River water is not sea water. 2. The oceans are NOT acidifying. They are still on the basic side and entirely within the normal range of fluctuation. 3. Photosynthesis is a very basic or alkalizing process and, in bays and estuaries, can raise the pH to 10–11 on sunny days. Organisms are quite able to handle this radical change. 4. If nothing unusual is happening, then what is the problem? 5. Most of the studies looking at ocean acidification acidify the water and look at how certain organisms react. Ocean acidification, if it did occur, would be slow enough for organisms to adapt easily. 6. As CO2 has been very much higher than now for most of the last 600 million years, why on Earth would people think that they could not handle a small change now? 7. The pH of the sea water is not what is important. It’s the pH inside the organism that counts and biological processes have no problem handling any changes that might occur with much higher CO2. The proof is that these organisms are here now. The Cliffs of Dover were not built during low CO2 conditions, but when CO2 was as much as 5–10 times higher than now—the organisms loved those conditions. 8. Around the world coral reefs are thriving as CO2 is food and they could not care less that there is a slight change, if at all, in the pH. Earlier on noaaprogrammer stated that phytoplankton sinks to form carbonate. It doesn’. The biomass forms polysaccharides the greatest store of carbon. There is slow equilibrium with CO2 and carbonate/bicarbonate. 9. Any protons released by the formation of carbonic acid in water cannot affect the equilibrium leading to calcium carbonate. A product of an equilibrium cannot affect itself. Only an outside source of protons could alter the equilibrium, such as a huge influx of sulfuric acid from a volcanic eruption. Fortunately, sea water is a complex buffer and it is rather difficult to alter the pH. More CO2 means MORE calcium carbonate and more coral reefs not dissolving reefs. THey have that chemistry backwards. Mr. Burnett! WELL DONE. Your article is in my WUWT Top 5 (so far). You did much for the sake of truth, today. Perhaps, that is why your job (it IS coming) was delayed. That article took a lot of time, I’m sure! Yes, indeed, Steve Burnett stood up and we all saw what a Science Giant he truly is. POSITION WANTED (for Burnett): Exceptionally bright, highly motivated chemical engineer; superb writing ability; fine attention to detail. References available from WUWT scientists. Correct. Your confusion arises from your temporarily having forgotten what the CAGW folks are all about: CONTROL. In order to control the energy market, human CO2 must cause global WARMING. It clearly isn’t doing that. Their hocus pocus [“makes little sense”] solution? THE CO2 IS HIDING IN THE OCEANS (we know this because …. the MODELS and our big fat lies say so). Like “The Blob,” dumped into the Arctic Ocean in 1959, human CO2 is lurking in the briny deep, juuuuust waiting to………………….. COME AND GET US. So, buyourwindmillsandsolarpanelsandcrappylightbulbs NOW to….. uh………. to avert certain disaster. LAUGH-OUT-LOUD — who do they think they are fooling? NO ONE! Either people are too busy or uninterested in their propaganda to pay attention to it (these people are not fooled, they are just not engaging), or they see the truth. It is only a matter of time until the pack of AGW cards lies strewn over the lawn, helpless, to be blown away by the winds of time, one…. by one………… by one. Steve, thanks for taking the time to think through and then pull all of the known “facts” together so that we could follow both your logic and your application of the known classical chem. eng. equations to their logical conclusions. Reading your excellent post, I felt like I was back at school having the TA explain the how to solve the fifth problem on the ChE Thermodynamics final! I had a couple thoughts that I’d like to interject that came to me while reading your post. First, I have often read that climate scientologists consider CO2 in the atmosphere to be uniform, well mixed, and having a slow turn-over rate, which is the reason why they rely on the CO2 concentration as measured on an active volcano in Hawaii as the “world’s standard” reference concentration. It seems to me however, that the water vapor that is transported up to and then condenses in low clouds and freezes in high clouds only comes into equilibrium with gaseous CO2 AFTER condensation has occurred. Please correct me if I am wrong, but doesn’t this mean that clouds and rain act as a scrubber to remove CO2 from the atmosphere. I would think it would be a simple experiment to measure the CO2 concentration of the air during a rainstorm to show whether the assumptions about CO2 being “uniform, well mixed and having slow turn-over”. If tiny little (ie. high surface area) droplets of water are used to scrub SO2 from flue gases, and the first CO2 scrubber used in a submarine used water as the primary solvent, it would seem to me that storms are nature’s “scrubber” and actively serve to maintain a balance between atmospheric CO2, and the CO2 dissolved in all of the water in the world – the vast majority of which is very strongly (even actively) buffered ocean. 3) Their has been a HUGE loss of a natural active SINK that would normally sequester atmospheric CO2. 4) Or of course, a little of ALL OF THE ABOVE. My bet is that the loss of huge areas of the Amazon rainforest has caused #3. The result will be that crops/other plants/the ocean will respond and the rest of the earth will continue to green. Every time I exhale my eyes burn and my teeth dissolve. Soon there will be nothing left of me. Volcanoes not only spew CO2, they also produce 36 million tons of chlorine a year and HCl is a strong acid compared to H2CO3. link Then there are the other gases… The most abundant gas typically released into the atmosphere from volcanic systems is water vapor (H2O), followed by carbon dioxide (CO2) and sulfur dioxide (SO2). Volcanoes also release smaller amounts of others gases, including hydrogen sulfide (H2S), hydrogen (H2), carbon monoxide (CO), hydrogen chloride (HCL), hydrogen fluoride (HF), and helium (He). Now think of that ever changing organic soup we call oceans. If the pH stays close to 8.1 to 8.2 despite this very dynamic system, a few ppm change in atmospheric CO2 isn’t going to mean diddle-squat. When you’re standing near the South pole and go away from it, you may insist that you’re becoming less southward but you are still going North. It’s just a wordplay with no practical meaning because your motion doesn’t depend on how you call it…..
You are not a chemist. Every time I see a label proclaiming “Chemical Free” I am tempted to ask if they are selling a container of absolute vacuum. Every time I hear someone say they have a throroughbred Labrador Retriever or whatever, I want to ask what race horse was the sire and how in Hades they managed to get a cross…. Precise language counts and the debasement of language is the refuge of scoundrels. Not an easy read at 7:00am (UK time) but it was worth sticking with it – a quite superb article, one of the best I’ve read here. This article and its conclusions would serve as basis for an excellent and informative TV programme (along the lines of Horizon on the BBC for example). Sadly I suspect that none of the valid points raised by you will make it to the airways anytime soon and certainly not via our biased state broadcaster which stopped doing proper science years ago. 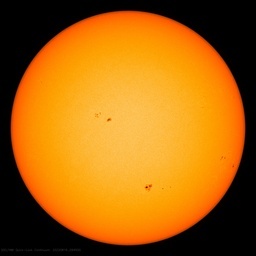 When the whole AGW thing fired up we were unprepared and lacked focus so the MSM and political scientists and politicians were up and running and held the public’s imagination. The run up to Copenhagen and Climategate got a lot of people off their bums and busy learning so the AGW supertanker took some time to slow and begin to turn. We still have the hysterics like WtD but they are fighting a forlorn rearguard action egged on by a few bitter enders but they have less and less relevance. Today we are many and we have focus and more importantly we communicate constantly thanks to the Internet. The OA story is being challenged and squashed thanks to our focus and articles like this one are totally excellent in that it is clear and cogent and accurate. Thanks Steve, and Anthony for putting it up. Uniform in the atmosphere is an assumption that is necessary for CAGW. see: link you can look at different months and the averaging of large samples. 4. In keeping with the requirement that CO2 in background air should be steady, we apply a general “outlier rejection” step, in which we fit a curve to the preliminary daily means for each day calculated from the hours surviving step 1 and 2, and not including times with upslope winds. All hourly averages that are further than two standard deviations, calculated for every day, away from the fitted curve (“outliers”) are rejected. This step is iterated until no more rejections occur. In other words they toss out any data that does not meet their preconception. Yes! It makes me shake my head (at the very least — usually, I say something precise, heh, heh) every time I hear a TV ad say “and no nasty chemicals” (or the like). For crying out loud! I was pleased to see (far above) that you weighed in here, Ms. Combs. I thought of you (and some others, but especially you) as I read Mr. Burnett’s fine article and thought, “I hope Gail Combs responds,” — and you did. You and George Orwell, great minds…. And, re: “less alkaline” it is very important to use precise language, for the key fact thus made clear (to all but the dullest among us) is: the oceans are STILL ALKALINE. There is no problem other than keeping politicians so scared about CAGW that they keep on giving you grants to keep people scared about the ‘problem’. Ryan, at the individual level, even you contain DNA that evolved hundreds of millions of years ago. Like many simpler species there is a lot of DNA that you are not actively using at any given moment. In fact I sometimes suspect that you are finding new ways to not use it. Be that as it may, experiments have demonstrated examples of bacterial resistance to antibiotics where, once acquired, resistance is not lost even in the absence of the selecting antibiotic. Gross generalizations are perilous. The ‘oceanic genome’ is incredibly complex, a system of powerfully adaptive organisms and awesome diversity. That metaphor has a landmine built in. The fact is that you still have to cross the equator. A solution cannot be come “more acid” until it ceases to be BOTH basic AND neutral. Bases are just as reactive and thus just as problematic as acids and can be quite as dangerous. Alkali flats are inhospitable because of the alkali (a base) so too large a pH will clearly be quite as bad for some as to low. The sole difference between saying the oceans are becoming “more acidic” and “the oceans are gradually neutralizing” and the “oceans are becoming less basic (or alkaline) is emotive. Becoming “more acid” is culturally scary. People “throw acid” at people for evil reasons. Becoming more neutral, which is in fact what is really happening to the oceans, is boring and will not lead to grants. You also need to add underwater volcanoes. There are tens of thousands of kilometres of underwater mid ocean ridge and island arc volcanos, which interact with huge volumes of subsurface seawater at high temperatures. Many of these subsurface volcanic rocks become enriched in carbonate, I know this because I routinely drill through thousands of metres of such carbonate enriched rocks whilst drilling extinct underwater volcanos for gold and copper. It surprises me that nobody seems pays any attention to the fact that these underwater volcanos exchange huge volumes of carbonate and other minerals with seawater; the average single volcano alone exchanges fluids on a scale of the order of several cubic kilometres of rock, and there are tens of thousands of these underwater volcanos extending all around the oceans about mid ocean ridge systems. They produce and exchange carbonate, as well as huge amounts of highly acidic sulphuric and other acids. Despite this, coral survives just fine all around these volcanos. But nobody seems to take any notice, as most of the coral reef scientists are biologists, not volcanologists. They never look at what is happening beneath the surface, only above. To take another example of this ignorance of what goes on in the subsurface, cooling magma expels water. There is a theory that pretty much all the world’s water in the land and oceans originated from within the earth, being expelled from cooling magma during the earth’s formation. In other words, all the oceans formed from volcanos, or cooling magma, more specifically. Don’t you think they might have an affect on ocean chemistry? The very shells etc. that line the seafloor and become limestone and chalk are a buffer. If the water tended acidic, they would be returned to solution and defeat the trend. I’m sure the world’s shellfish have taken the ocean’s pH level in hand long ago and are keeping it just where they want it. IMHO that’s one of the best technical essays that has appeared here for some considerable time. Well done and thank you. I was incredibly surprised to actually see the article go up, and even a bit more surprised at the support I received. I wanted to address some common threads that I have seen Just from what my research found. alkalinity is a complex measurement which is supposed to be taken as the entirety of ions in the solution. Alkalinity will increase with increasing CO2 concentration as long as there are solid sources of CaCO3- in the solution, It will be unaffected by simply dissolving CO2 in seawater. Because CO2 does increase the number of H+ (or hydronium or however you would like to call you complexes) the pH does technically drop it however does not drop significantly and the actual drop does not negatively impact the carbonate ions in solution as it would if the acid was a strong acid or more importantly any other kind of acid besides carbonic. Thank you for the criticism, it is both constructive and necessary, I hope to refine my argument further with more input and I simply cant do that without devils advocates. I frankly don’t know why the key scientists seem ignorant on the basic chemistry, I have seen more discussions on models than actual measurements. I agree that pH fluctuates, I was more specifically calling reference to the claim that we have somehow measured an increase in acidity of 30% and that mans influence has dropped oceanic pH by.1 units. pH fluctuations are very normal in all environmental systems and are driven more by biological emissions than human emissions. I wasnt arguing that the pH wouldn’t drop with enough CO2 it most assuredly will, but even if the pH drops in a carbonic acid system that is unlikely to have a major effect on carbonate organisms. Your absolutely correct in many ways about previous pH values being smoothed. Oceanic core samples aren’t just subject to diffusion forces at the boundary layer they also have their own microcosmic pH values as diffusion occurs slowly and there is an abundance of both micro and microorganisms that make this region their home. At the end of the day I take a somewhat different approach with regards to stressed species in niches environments on the cusp of survival. Simply put they are likely to die out anyways with any environmental change, so goes the march of evolution, in reality only a small handful of scientists will know of and mourn their passing. That’s not to say it wont happen but it certainly isn’t likely to affect global food stocks or collapse the oceanic ecosystem. again thank you for playing devils advocate, there simply hasn’t been enough discussion on the issue for me to add those points in yet. The last thread of arguments I would like to address is related to whether or not mollusks will or will not die, ancestral differences etc. First if carbonate ions aren’t the limiting substrate for shell formation (and they really should be with such incredibly low ion concentrations) then it is possible that with enough carbonic acid, after overcoming the buffer capacity of the oceans, and with a high enough CO2 concentration such that equation 6 strongly proceeds to the right (which would essentially require all other Ca CO3 minerals to have already been consumed) that maybe you could impact the shell production of mollusks. However the claims are very strongly to the statement that CO2 induced acidification depletes the carbonate ion. this is chemically impossible. if the pH changes through other means than yes there would be a problem. Many thanks for this well explained report. But. Your assumptions about preindustrial atmospheric CO2 content could be far off because the assumptions about CO2 in climate models are wrong and measurements of CO2 in Victorian times, around 1890, give levels at 490ppmv from various parts of Europe. The methods used then are the same as today, chemical analysis. Ice core data has poor accuracy with CO2 content measurements due to gas migration with ice compaction. (see Dr Salby youtube lecture). All alarmist assumptions are that it is anthropomorphic CO2 that is the problem but this is 3% of the total annual CO2 budget. Of the 97% most comes from the oceans probably due to CO2 injection at the ocean ridge volcanoes which are rich in CO2 as well as other far more acidic gasses. Land sited volcanoes are also vigorous CO2 producers. For interest the experiments carried out by Southampton University into acidification were modifies after CO2 produced no effect by adding hydrochloric acid which did start to affect mollusc shells. This was shown as proof of CO2 problems! The scale along the bottom is in days. Note that the pH of the local ocean here changes more in one day than the entire change predicted for the year 2100. People have a couple of huge misconceptions about the ocean. One is that the pH is constant, which as the above graph shows is far from true. Again the scale along the bottom is in days. The daily swings are in some cases the size of the total change predicted by 2100, but in this case the swings in pH are being generated by the living creatures of the reef itself! They are not the result of the lovely equations the author posts above. His equations are exactly right, near as I can tell … but only if the oceans were exactly dead. And that is the missing link in this post. Life, with its complicated carbon chemistry and carbon usage, is a huge factor in the ocean, where every cubic millimeter is pulsing with living things. And as a result, we can’t really tell what will happen due to a change in atmospheric CO2, in other than a general way. How much of the acidification is due to the deliberate introduction of cyanide to the tested areas? Thanks for a very enjoyable essay. It’s nice to see basic science without shred of agenda being used in such an articulate and clear way to present the basics of seawater pH changes. One observation compared to the usual bun fights involved climate science where the battle ground is feedbacks, there seem a shortage of positive feedbacks when it comes to “ocean acidification”.Every feedback seems to be negative. Are there any positive feedbacks in this debate? ….One observation compared to the usual bun fights involved climate science where the battle ground is feedbacks, there seem a shortage of positive feedbacks when it comes to “ocean acidification”.Every feedback seems to be negative. Are there any positive feedbacks in this debate? Yes there are a couple. The buffer system itself reacts to kept the pH within narrow limits and is supported by the lithosphere (rocks) going in an out of solution. The second as Willis so elegantly showed, is life itself, where the coral reefs act to keep the pH in even narrower limits. They sound like negative feedbacks to me. All the studies really do is show which organisms stop growing when Ca/Mg/etc is not available…..duh! Thanks for the nice write up Steve and all of the well thought out comments folks. Upon consuming 2 cups of coffee and an hour of my work day reading all this good info and exchange of thought, I find myself in a similar position on conclusions again. Just like AGW, acidification falls into the same category. When all the known variables are taken into consideration, we simply don’t know the real answers to the simplest questions. How many variables impact either climate or acidification? Thousands,,,,,, millions? Here is a simple challenge. Let’s just take 3 variables and see if we can quantify the impact on ocean acidity with them. Now with only 3 considerations to deal with when calculating the net oceanic PH change, it should be quite easy to calculate, no? As a physical chemist I salute the clarity of your explanation, Sir! I feel compelled to add that 2 major factors have gone unmentioned, however. Zooplankton are ubiquitous in the oceans, and absorb copious amounts of bicarbonate ion to produce their own exoskeletons – corals in particular form reefs in areas where a solid surface and sunlight (for algae) are both available. Gravity is also a factor, in that the exoskeletons of free-swimming zooplankton are rapidly removed from the ocean currents through application of Archimedes’ Principle, forming limestone on the ocean floor. Limestone formation is a continuous and major process, having created rock formations thousands of feet thick over thousands of miles’ extent. This is a significant carbon ‘sink’ often overlooked and, to my knowledge, never incorporated into computerized climate models. No they didn’t lol. Their ancestors did. The species alive today have not contended with 500+ ppm CO2 in a LONG time. No, a few million years, which is not a long time for Nature. Before the Ice Ages the oceans were considerably more acidic (less caustic) than today. Nature did just fine. Worrying about ocean acidification is like worrying about a small change in average temperature over a period of 100 years, when every day the local temperature varies by 5 to 10 times as much. It life can handle the large change every day it can certainly handle a small change over much longer timescale. The same thing happens in the oceans. Local pH regularly changes as much as 10 times more than the projected average change over a period of 100 years. So, it life can’t handle a small change over 100 years it surely cannot handle a much larger change over timescales of days or months and the life in the oceans would today all be extinct. I was taught that adding an acid to a base was “neutralization”. Also that salts acts as buffers, and will resist any attempts to make the solution acidic. Thus it is easier to make fresh water acidic than it is to make salt water acidic. There was a big scare about acid rain making fresh water lakes acidic 50 years ago. Then it was discovered the culprit was evergreen trees. Thus, the solution to preventing acidification of lakes and streams was to cut down all the evergreens. As a result, no one talks about acidification of lakes and streams. Then there was the big scare about frogs. Until it was discovered that frog researchers were the cause of frog death. So no one talks about frogs anymore. Then there was the big scare about Global Warming, but the globe stopped warming so now no one talks about Global Warming, instead it is Climate Change. Then there was the big scare about Ocean Acidification, but then it was discovered that the oceans were not acidic, they were caustic, and adding CO2 simply made them less caustic. Ed has the solution: an array of pH sensors around the world, averaged together (pHmax-pHmin)/2. We should get a ph value to 10 decimal places without the need for error bars. As pH sensor technology improves we can ‘discover’ step changes in pH values that we will need to develop ‘tricks’ to remove. I am sure that someone bright will discover Volcanic pH islands and develop an algorithm to remove the obvious distortion to the global average pH figure. I can sea (sic) a whole new field opening up for those who are expert at gaining grants. LOL – A follow eye-roller when they walk through the organic food section…. of course it is. I would like to add a couple of things: Aragonite is a polymorph of Calcite, (same chemical composition, but different crystal structure.) All modern deposition of Calcium Carbonate is from Aragonite, which over time through a process of diagenesis is changed to either Calcite or Dolomite. This process is controlled by the saturating fluid of the sediments. modern Carbonates form. Thus with warming a larger portion of the ocean will sequester more CO2 in the form of carbonate sediments. An additional piece of evidence is the amount of Carbonate in the rock record of the Paleozoic. The Permian basin has thousands of feet of Dolomite formed during the period for which it was named. Carbonates form in numerous ways and although most people understand the formation of carbonate shells by organisms, much of the carbonate record is composed of calcium lime mud, which has few fossil organisms. Other rocks such as Oolites, form behind reefs in current dominated waters, and are apparently an inorganic process. All of the white sand beaches I have visted in the Caribbean and Gulf coast are mainly composed of these grains. Steve, I very much enjoyed your post, good luck with your job search. Basically, with lower pH in the water, Ca++ becomes more soluble and calcium carbonate shells are harder for the little beasties to form. A good starting point is 35 parts per thousand salinity, 2200 uM alkalinity, and the pCO2 of your choice (in ppmv). No discussion of ocean acidification would be complete without a discussion of alkalinity, a simple chemical variable that in effect measures the buffering capacity. 1. The oceans are acidifying. Balderdash, as your post goes on to show. Why do you repeat alarmist propaganda as the truth, when you know better? A little more good, old-fashioned scientific rigor, please. Also, aragonite and calcite, the two minerals of calcium carbonate have the same chemical formula but different properties, with different solubilties. I agree with the comments above concerning precision of language. Sloppy expression gives the game away. Slight fluctuations in alkalinity is not, repeat not, acidification. I think demonstrates again the assertion-type “science”, as opposed to the empirical, that seems to satisfy climate scientists of the CAGW camp. I take away the following: it doesn’t eliminate all potential concerns, but it does convince me that losing sleep over disastrous pH change in the oceans is at least one heck of a way off. It also tells me that if the alarm has been raised because of acetic acid experiments, then the issue is even farther off than a heck of a way off. This means that unless the researchers know everything about the care and feeding of the sea life they are studying in a lab setting, they can attribute to CO2 results from an imbalance that would not occur in the ocean, and as I said before I doubt they duplicate the ocean basin (lithosphere) in the lab. …..Basically, with lower pH in the water, Ca++ becomes more soluble and calcium carbonate shells are harder for the little beasties to form. I suggest you study the subject of buffers indepth. Here is a place to start that explains why Wiki is too simplified and lies by omission. Good points, but I would add that in properly designed tests, control groups should mitigate test design flaws. HOWEVER, the Mendelian Fudge Factor could come into play. Overall an excellent well written piece that accomplishes the goal of discrediting alarmist concerns like those found in the youtube video. However, the more scientifically sound literature is more concerned with (super)saturation state and saturation depth claiming that calcifying rates decrease even with decreasing super-saturation states in organisms. In other words, according to them (and the papers they cite) whether the seawater is at 200% saturation or 300% saturation makes a difference to calcifying organisms. Suffice it to say there are a myriad of reasons why even an avid surf fisherman like myself needn’t worry about “ocean acidification” (argh, I still hate that technically correct but misleading phrase) and you covered quite a few of them quite well. You’re definitely right that this issue is their proverbial ace up the sleeve and we should be prepared for them to use it more as the “warming” isn’t cooperating and extreme event wallowing will get old eventually too. While much of Wikipedia may still be relatively free of overt political corrections, I can no longer trust that simple chemistry pages about pH will remain free of the ‘William Connelley’ touch from one day to the next. Hi folks there are some phenomenal questions here and I would really like to address them all. It is however its a bit difficult to achieve the personal touch through this thread. If you have any other questions, critiques, praise or hate mail you can throw it at me through linked in. I’m pretty sure that’s a shameless self promotion but its really done with the best of intentions. First someone a couple people have pointed out my equation 6 is … well off. I believe you are correct. 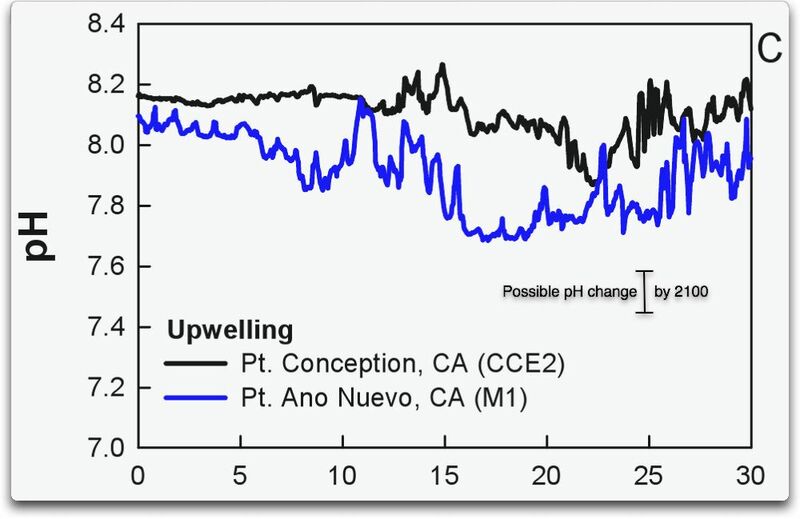 Ca++ + CO3– + H+ –> 8.199 can occur with an increase in pCO2 in the atmosphere of 30%. This change however small would still be a form of acidification, however at the same time the solution would simultaneously be increasing its alkalinity, and any future acids would be buffered accordingly. This is why I was saying pH is irrelevant in a carbonic acid/carbonate context. Outstanding read for a non-scientist with a basic understanding of chemistry (one College course). Hope someone hires you very soon. I enjoyed Willis Eschenbach’s graphs of seawater pH changes – real data, real measurements. -Take real open sea surface water (not fresh water, preferably not coastal seawater). -Filter it by 0.5 micrometer filter (to get it rid of bacteria which could spoil the results) and/or sterilize it in airtight container. – Cool it to 16.7 C.
-Cool the water in place with controlled temperature 16 C where you put it (optionally on ultrasonic/magnetic stirrer to accelerate the reactions) in container avoiding contact of the water with the surrounding air (a simple flask with 1-tube in/1-out will do the job) and let 280 ppm CO2 air (a mix of 78.09% nitrogen, 20.952% oxygen, 0.93% argon and 0.028% CO2 – air with appropriate part of CO2 freezed out) bubble through water for some time (hours). -Then take sample and measure the water pH. -Then take the same seawater warm it back to 16.7 C and let ~400 ppm CO2 air bubble through it. -Again take sample and measure the water pH. -Repeat or do simultaneously with at least 4 samples. I would think such a simple experiment (doable in any standard chemical lab) can put to rest the longlasting academic disputes whether the CO2 elevated levels in the atmosphere can overcome the buffer and actually cause significant seawater acidification or not. I suspect you forgot the comproportionation of carbonate and carbonic acid to hydrogen carbonate at the given pH. If the carbon dioxide concentration in the atmosphere increases, the one in water will increase along (Henry’s Law), and along goes the carbonic acid concentration. For every mole of carbonic acid (44 g), you will dissolve a mole of calcium carbonate (100 g). It’s not a concentration thing, it’s an amount thing. The issue frankly is not that simple. The problem with a beaker filled with chalk and continuous CO2 being added is you can replicate the same effect at any atmospheric concentration of CO2 it simply takes longer to dissolve. In order to prove harm we need to know whether or not carbonate is the limiting reactant for calcium carbonate reactions. You would also need a near continuous feed into your system from other calcium carbonate sources. So the question isnt will calcium carbonate dissolve its will all of it dissolve. Try performing the same experiment with a glass half filled with chalk powder, such that not only is the water saturated but there is a substantial layer on the bottom are you able to blow enough air into that glass to dissolve the half full glass of Ca CO3? are you able to do the same thing with a stir bar in the glass that is half full? If either of those show complete dissolution then there is no level of CO2 which wouldn’t cause complete dissolution eventually. If it doesn’t all dissolve then that would entirely nullify the ocean acidification hypothesis as clearly Ca solubility is a factor. Aren’t there the Carbonate compensation depths under the so called lysocline? Isn’t the solubility rates of Calcium carbonates rising over their formation rates only at a quite high pressures and low temperatures at relatively very high depths of several kilometers? Isn’t this basics of basics of the ocean chemistry the NOAA administrators should know by heart? Aren’t the calcium carbonates practically insoluble in the basic sea surface water and what the madam shows in the video with the chalk, fresh water and acetic acid in it isn’t it basically a severe scientific misconduct if she suggests it has something practical to do with the living pteropod shells dissolution purportedly due to rising CO2 levels in the atmosphere? Aren’t the pteropods and most of the calcifying organisms living mostly way above the lysocline and calcite saturation horizon? Which brings me to a rhetorical question: Isn’t the video and it’s dissemination, especially at the official NOAA YT channel, around the edge of a conduct called federal fraud (under USC 18 §1001 sec. a/2)? Glad to see people weighing in on imprecise and misleading language use. Thanks Gail Coombes, and others. To say ”more acidic” clearly implies that you consider the oceans are already acidic. “More” means extra or an increased amount of anything you have already got or your start point. In this debate let’s be precise so no one misunderstands the issue. The use of terminology such as ”more acidic” or ” oceans are acidifying” leads many people to believe they are already acidic and becoming more so, and will get to a stage where things dissolve. Hence we have so much controversy, such disbelief when we try and discuss this subject with believers that that is happening. It’s also terminology that alarmists are very happy to perpetuate because they know it has that scary effect on people. We here need to be mindful that we make our job harder by also using such terminology. It is incorrect, imprecise and implys the wrong impressions. Great article though. loved it. Interestingly, H+ in sea water is not constant and varies naturally by 500 to 1000%. Doesn’t a dissolution of CaCO3 actually rise alkalinity by adding the CO3– (cappable to absorb two H+ ions)? Does the addition (or removal) of CO2 to a solution change the alkalinity? Isn’t the answer No? Isn’t it because the net reaction produces the same number of equivalents of positively contributing species (H+) as negative contributing species (HCO3- and/or CO3–)? I looked again at wikepedia and could not see any evidence that William M. Connolley edited that page, and I checked the William M. Connolly page and found that William M. Connolley had edited his own page. And the page you cited is rather mute on the subject. Or you could try it yourself, chaulk and acid are easy enough to come by. No, because there is a huge reservoir of precipitated salts in the form of limestone and similar rocks that will reenter the solution to prevent any attempt to overcome the buffer. CO2 with human characteristics? That’s a new one! I would guess so, but wouldn’t it be nice to confirm this with experiment to put the ocean acidification hype to rest? The Permian basin has thousands of feet of Dolomite formed during the period for which it was named. There is daily data at Monterey Bay as well since they monitor their ocean intake water. ……Good points, but I would add that in properly designed tests, control groups should mitigate test design flaws. If you are doing the tests under lab conditions, then you are not able to duplicate actual natural conditions, This means even though you use a control, the changes you see in the test groups may not represent what you would see in the wild because of all those other factors found under natural conditions coming into play that you have not duplicated in the lab. Time alone can be a big factor. As a caver in college I got shanghaied into helping Beep Hobbs (Horton H. Hobbs, III) with his cave crayfish studies. Turns out the evolutionary change from a normal crayfish into a blind white crayfish happens much faster than was originally thought if I recall what he told me correctly. ….Or you could try it yourself, chaulk and acid are easy enough to come by. I did it as a thesis topic in college using limestone and HCl to determine the different disolving rates of differnt types of limestone. I have also titrated buffered water and watched the needle on the pH meter stubbornly stay put until all the buffering action was neutralized. And I will repeat, you are missing the whole point the ocean is a BUFFERED SOLUTION! That means you will have to dissolve ALL the limestone, dolomite, anorthite, and kaolinite in contact with the ocean first before you will get the pH to move beyond the limits Willis gave. …A buffer can be defined as a reaction system which modifies or controls the value of an intensive (i.e. mass independent) thermodynamic variable (pressure, temperature, concentration, pH, etc.). Our carbonate system above will act as a pH buffer, by the presence of a weak acid (H2CO3) and a salt of the acid (CaCO3). The concentration of CO2 (g) and of Ca2+ (aq) will in the equilibrium Earth system also be buffered by the presence of CaCO3, at a given temperature. If the partial pressure of CO2 (g) is increased, the net reaction will go towards the right because of the Law of Mass Action. If the temperature changes, the chemical equilibrium constant will change, and move the equilibrium to the left or right. The result is that the partial pressure of CO2 (g) will increase or decrease. The equilibrium will mainly be governed by Henry’s Law: the partial pressure of CO2 (g) in the air will be proportional to the concentration of CO2 (aq) dissolved in water. The proportional constant is the Henry’s Law Constant, which is strongly temperature dependent, and lesser dependent on total pressure and salinity (Drummond, 1981). In other words ‘Ocean Acidification’ has been a KNOWN red herring since 1970 when it made its first test flight along with ‘Acid Rain” The only reason it is being floated again is because most people haven’t a clue what a buffered solution is. Well said Gail. In the big bad world of PR and spin however I expect the con artists to influence the unthinking into believing the Ocean Acidification nonsense for a while. Well the alarmists claim that it is only fossil fuel burnt CO2 that is the problem so it has to be different to cause the problem but at 3% of the total their claim cannot hold water. This was done over a decade ago, for example in Riebesell et al, 2000. Each of those gives piles of other references to look at. Problem with that particular research is that the experimental conditions barely resemble real living sea conditions. They tripled the CO2 by bubbling, “adjusted” alkalinity with HCl and NaOH… And even so they didn’t get significant decalcification results for CO2 doubling (that’s most probably the reason why they tripled it). I understand buffered solutions well enough, if you reread what I posted, I wasn’t arguing at all that the problem was ocean acidification, lowering pH, neutralization or anything of that nature. Adding CO2 to the oceans increases the solubility of Calcium Carbonate, which affects the ability of animals to produce calcium carbonate shells. Calling the buffering capacity of the oceans infinate is not accurate. Ferd Berple, I had no idea about the dolomite. Thanks. I wonder how all the dolomite formed. What proof of this do you have beyond your supposition? It was Dr. Jane Lubchenco, a marine ecologist and one-time NOAA administrator, who performed the infamous experiment substituting vinegar for carbonic acid in her demonstrationstatration before the House Select Committee on Energy Independence and Global Warming Dec. 2, 2009. For example, if not ignorance, then perhaps Lubchenco’s motive was willful deception? Foraminiferal boron isotope ratios as a proxy for surface ocean pH over the past 21 Myr provides evidence that ocean alkalinity is near a record high. …I find that I can still believe that comparatively small shifts in oceanic pH could be disastrous…if they do indeed happen too fast for the stressed species to evolve. You can resolve your questions by actually simply examining the shells of living sea creatures in a controlled environment rather than spreading fear and enuendo concerning the fate of the shells of dead sea creatures as they fall to the ocean floor. Having been a commercial fisherman for 60 plus years and making my first voyage at the ripe old age of two weeks I do know a little of which I speak. In 1972 the research vessel George M. Bowers was taking water samples for oxygen because of farm runoff west of the Mississippi River. At that time I was catching fish for the pet food industry and the Bowers took one sample less than a mile from where I was catching ten tons an hour of live two to five year old fish. While offloading that catch I was informed by a NOAA employee that would more than likely that be my last trip catching cat food because the scientist were saying the Gulf of Mexico is a dead zone and nothing could live there due to lack of oxygen. Those same studies have been going on all these years but the coverage has expanded over a much larger area and that dead zone has grown. The trouble is the stupid fishermen in the Gulf of Mexico keep catching dead fish, shrimp, crabs and oysters from that dead zone but production has fallen. The truth is we overfished the population and killed the live product we pulled from the dead zone. The thing to remember is that you and I paid for these scientist to tell us a lie so pat yourself on the back you’ve done a good job of spending our money for really learning absolutely nothing of value. That my friend is from a seventy-five year old idiot fisherman with an IQ of 142 and no I’m not a genius but I do pay attention. I stopped reading after the first equation as well since no definitions are given for what they even stand for. Steve may be right but the presentation is very sloopy it seems to me and not very accessible to the lay-reader.